VPN searches from Turkmenistan have increased a massive 577% in the spate of a week since new blocks were introduced in the country on January 17th. Turkmenistan the central Asian country bordered by no less than 4 other countries and the Caspian Sea isn’t known for its liberal attitude to the internet. After all, it has one of the slowest and most expensive internet services in the region. Costing upwards of 10% of the average weekly salary for just 4GB of mobile data, common complaints include the inability to access any social media sites coupled with speeds so poor that doing almost anything worthwhile is rendered useless. Reports from Tajikistani news site News.tj suggest that on the 17th January the Turkmenistan state-owned telecom provider started to crack down harder on VPN users. It is the only available internet provider in the country. This was coupled with a blocking of the Google Play Store to limit the ability of Turkmenistan citizens from downloading VPN apps. In the period between 15th January 2019 and 21st January 2019, we have seen a huge 577% increase in the number of visits to our website from users in Turkmenistan compared to the previous week. VPN searches to VPNCompare.co.uk up 577%. Social Media and well-known messaging services such as Facebook, Twitter and Whatsapp are blocked and many Russian social media services like VKontakte and Odnoklassniki have also been blocked across the country for a number of years. However, savvy-Turkmen users where possible have been able to bypass such restrictions by making use of VPN services. 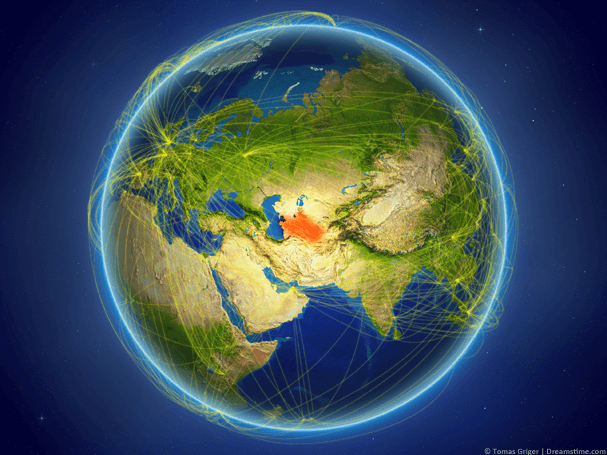 Using a VPN service does not come without risk in Turkmenistan. A report published in 2017 suggests that anyone caught attempting to access VPN services will be subject to “administrative penalties” and required to visit the Ministry of National Security where intimidation is likely. While many Social Media networks and messaging services remain blocked in the country the government rejects claims that there are any restrictions placed on the internet in the country. Unconfirmed reports suggest that anyone attempting to access VPN services will find their sim card blocked. The only way to resume connection is by inserting a new sim card. Other reports claim that repeat offenders will be summoned to the Ministry of National Security for “a conversation” echoing similar reports from 2017. There has been no official word about the reason for the latest crackdown but with the Turkmen government even failing to acknowledge previous blocks it is unlikely any official clarification will be forthcoming. Reports suggest a large storm or “hurricane” which occurred at the same time is the cause. In an effort to stop the spread of photos and videos across social media of the resulting destruction the block was increased. Others claim heightened tensions at the Afghanistan border are responsible with some speculating the Taliban had breached the border. 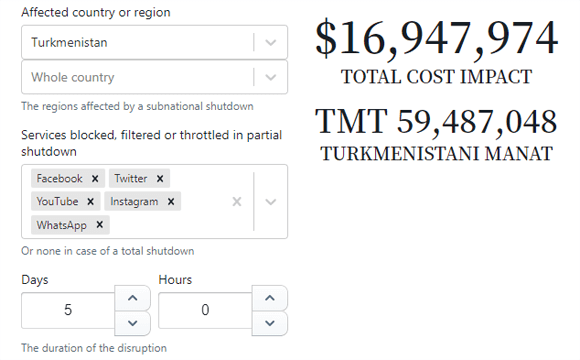 To make matters worse, the estimated economic impact of such a block for just the 5 days since the increased blocking against only the most popular social media and messaging services could be in the region of nearly $17 million according to NetBlocks “Cost of Shutdown Tool”. With Freedom House giving Turkmenistan one of the worst ratings for freedoms across the country (just 4/100 in 2018 with 0 being least free) the picture is looking bleak for residents looking to keep informed with both local and international news or simply conversing with friends.